Software development is the most in-demand skill for technology jobs in the U.S., according to a study by Wanted Analytics. More than 232,000 jobs for software developers have been advertised online in the past 90 days, an increase of 3 percent over the same period in 2012, and more than 120 percent from four years ago. The business intelligence firm considers positions including Web developer, computer systems analyst, IT project manager and software quality assurance engineer as involving development skills, in addition to those concerned strictly with creating software. Seattle saw the highest demand, as well as the largest year-over-year growth – 15 percent. More than 21,000 jobs for software developers were posted there. Rounding out the top five markets were Washington, D.C., New York, San Francisco and San Jose. Wanted Analytics’ Hiring Scale, which scores jobs from 1 to 99 based on their projected difficulty to recruit, ranked software developers a 76 across the nation, indicating they’re tough to find. Cities where the difficulty is greater than the national average include Saginaw, Mich., San Francisco and Baltimore. Employers will find less competition in Santa Rosa-Petaluma, Calif., Columbus, Ga., and College Station, Texas. Interestingly enough, outsourcing company Cognizant Technology Solutions has just announced it’s setting up its U.S. headquarters in College Station – home to Texas A&M – and will hire 10,000 tech workers in the U.S. over the next three years. Software developer also ranked first on Forbes’ Top 10 jobs of 2013, a list of occupations requiring at least a bachelor’s degree. 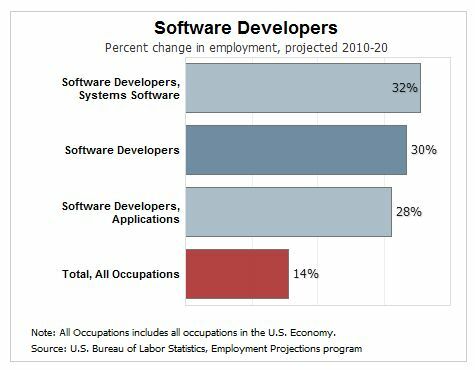 Data from the Bureau of Labor Statistics used in a ranking from CareerCast showed software developers as having the third best job in the country, behind actuaries and biomedical engineers. Those rankings were based on criteria including work environment, job stress, hiring outlook and average salary. Health IT vendors especially have been courting software developers. Orion Health announced plans to add 300 and eClinicalWorks is in the market for 100. Software Developer: Best Job in the Country? I live in Saginaw, Mi and would love to know just where the claim of “Cities where the difficulty is greater than the national average..” relates to this town? I looked up Saginaw, and I tend to doubt anyone is taking any statistics for any city with less than a million population. If you’re interested, you probably should look up the stats for Detroit. Can I giggle about the HTML picture with the type of article posted? That’s great, more Software Developer jobs in the USA. Why even post that? They aren’t going to hire people from the United States, they’ll bring people from the outside. Which is fine, I guess, but posting it like this and making it look like something else. When I am done with my degree, I am going to be looking for a software developer job outside of the United States. The destructive direction this country is going is a big turn off and the failing education system scares me. This place isn’t a positive place to raise a family. If I was younger I would be doing the same thing. Best of luck to you. Many Americans will have to do the same thing in the future. Here’s a suggestion: Recruiters, especially those who work with consulting companies, need to lower their expectations when looking at candidates, or directly hire these candidates and give them low-risk projects and training to assist in increasing their skills and experience to meet demands. As it is now, you’re going to get a lot of college graduates that have big ideas and little to no professional experience, and – You’re going ot have to realize this as well – cannot afford to make a living in or move to cities like Seattle, even if the minimum wage is $15 an hour. Application Developers. Has been going on for years and will continue. Labor is much cheaper in places like India for this type of work. As for anything with Analyst in the title, it’s a bit more difficult to outsource. You can’t have someone in India trying to gather requirements with someone sitting in the U.S. Yeah, yeah, yeah, I see all the hype about teleconferencing, but the fact is many companies still want the analysts within arms length. Of course, they can still outsource those jobs to a U.S.-based company. This is merely another corporate lie to allow corporations with government help to send jobs offshore and continue bringing in a foreign workforce to take the jobs that are left in the U.S. away from citizens that are totally capable of doing the work. I wonder if the author is really that naive or just happy with the economic crumbs thrown her way to continue selling this lie? You are totally correct. I’ve been in this field for over thirty years and in the last 20 years companies go after the green card holders first and then American citizens. As an independent consultant for every company I have worked at since the mid 90’s have been roughly 80% green card workers. This does not count the IT jobs that get sent over seas to countries like India. Instead of trying to recruit people “too” a location, how about using those of us with these skills to work from home by telecommuting? We do speak the (assorted) language(s) including English. I think I read that Cognizant crap last week. 10000 more H-1B’s in Texas.